Salim Ismail, the author of Exponential Organizations and an expert in helping organisations leverage technology and strategy to grow faster, suggests, “Today, if you’re not disrupting yourself, someone else is; your fate is to be either the disrupter or the disrupted. There is no middle ground.” While his comments were directed towards organisations, it equally applies to your career. You need to be comfortable designing and orchestrating your own career path now more than ever. This starts with realistically assessing your career and determining whether you are in a rut or holding on to an unrealistic, outdated view of your career. As well, it’s an opportunity to challenge your view of what’s possible and to consider a future where you create the career options rather than wait for options to come to you. • Are you satisfied with where you are at now? • What else could you do to add value to your career? • What further learning do you need to investigate to enhance your career? • What other relationships could you build to advance your insights and connections? • What does the next step in your career look like? Being ready to embrace the future means you need to step beyond what’s familiar and comfortable. This is often an internal debate between what you could do and what you should do. Could being something that is unexpected, challenging, risky or slightly left of centre; should being the job that people expect you to do or the job that your beliefs limit you to. Breaking away from the “should do” means you have to walk away from the expectations of others and shift your expectations of yourself. It starts with ditching any unhelpful internal dialogue you say to yourself about your career that may be holding you back or hindering you. • What are the rules (both written and unwritten) I’ve been told about my career and career change? • Which of those have held me back? • Which ones have propelled me forward? • Which ones are no longer relevant? • Which rules am I prepared to ditch? • Are there new rules I need to create to help me leap into a new career and stay professionally relevant? Finding your purpose—your why—isn’t simple. There’s no magic formula and you don’t find it just sitting around. It is an iterative process that involves a bit of soul-searching and paying attention to what matters to you and motivates you. Research shows there are correlations between proactive personality types and career success. A proactive personality is defined as a tendency to seek to change one’s environment, not be constrained by situational forces, and to seek out new and different opportunities and show initiative. Explore your options. Understand your tolerance for change and risk as it relates to your career, identify your strengths and know how the world of work is changing to be able to identify options you can progress. Deliberately select what you will progress. Filter your options to find your sweet spot—the options that fit with your life circumstances, goals and willingness to take a risk. Construct a plan to follow. 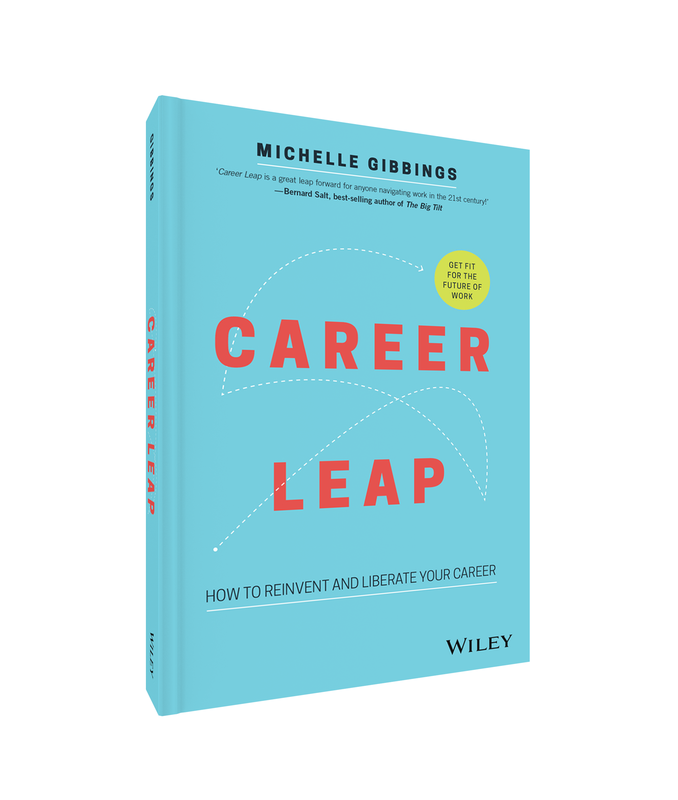 Build your plan to execute your career leap. This includes considering all the key elements that need to be in place to make it happen and how you are going to target and measure your progress. Influence how you enter the market. First impressions count; not just face-to-face but also online. In fact, it’s now more than likely your first encounter will be online. You need to build your online presence as well as manage your network in a way that suits your career leap destination. This doesn’t mean you say no without careful thought. Rather it’s about saying no with consideration of others and compassion for them and yourself. When you are faced with this dilemma ask yourself: What’s the right thing to do for you, with consideration of others? As you build your business and make your career leap you will have good days and not so good days. Consequently, managing your energy is critical. You may not notice the impact that the working environment is having on you, unless you stop and prioritise taking care of yourself. As you juggle constant demands and pressures, your brain will be on overdrive as it is constantly solving new problems. Map out your schedule and include time for you. Put this in your schedule and commit to it. When you are busy it can be hard to prioritise yourself. However, your body needs time to rejuvenate to ensure it operates at peak performance. Don’t waste your energy on things outside your control. Stephen Covey, in his book The 7 Habits of Highly Effective People, explained how you are far better to focus your energy on those matters you can influence. However, we often spend our energy on things we are concerned about, but have little or no influence on. Recognising and accepting the difference is a crucial step in directing your energy positively. Establish core rituals and new habits, which may include a weekly massage, listening to music or a daily run. Pick something you really enjoy doing and is revitalising for your body and soul. When you create a habit it becomes much easier to keep doing it.